Winter is never my favourite season mainly due to the fact that I don’t like the cold and damp, so I can always be relied upon to be a bit biased but this year Winter already seems so long. January seemed to last forever for some reason and I know from conversations with people that I am not alone in feeling this. This year I was more than happy to have actually turned to the new calendar month of February and the beginning of Spring. A few years ago after spending much of my life telling anyone that would listen that February was my least favourite month, one that I was always glad to have over with the promise of better days ahead, I did some exploring. I discovered that this was in fact the month where we really begin to welcome back the light that we have been waiting for since Winter Solstice and there certainly does seem to be a stretch in the days now. I also learnt that the original Roman name for February was Februarius, named after the Latin Februum meaning Purification. I found out that every year on 15th February, the night of the full moon in the old Roman Lunar calendar, a Purification ceremony known as Februa was held. February is also where we find the period known in the pagan wheel of the year as Imbolc which may have got its name from the old Irish Imb-tholc meaning to wash or cleanse oneself in a ritual cleansing. This may also of course be where our idea of Spring Cleaning came from. These discoveries gave me a way to approach the month so that has some purpose By connecting with it in a different way I am beginning to appreciate it more fully. I now try to use the month of February to cleanse, purify and prepare myself for the months ahead. By doing this I am know I preparing the ground for the seeds of whatever I want to bring in during the coming months. I have been doing this now for the last couple of years and am finding that each year it takes a different form. Sometimes I am drawn to a physical cleanse, other times it is an energetic one and some years a mixture of both. The Romans would have made the whole month a time of cleansing and purification which seems a bit OTT and spring cleaning the whole house sounds like hard work but there are always a few nooks and crannies that I know get overlooked during the quick lick and polish it gets usually. Already this month the house has been given a thorough hoover, working with the element of water floors have been washed and the doors and windows opened wide both in the house and the healing room to let the element of air do its work. In the shower this morning I was also mindful of taking time to cleanse my body, paying attention to how it was feeling and enjoying spending time with myself rather then rushing as I usually am. Maybe this is partly what cleansing and purification does. By taking time, paying attention, seeing and sensing what is there we are more mindful of what we are doing. The more mindful we are, the more we can see what really needs to be done. If we spend time living with awareness as we cleanse and purify we can see beyond the surface, beyond the superficial. This is then something that may also be good to carry forward into the rest of our lives, what better way to sow the seeds for the months ahead than to use February to learn to live each moment with awareness. When I first started teaching courses and workshops I did what everyone else does and blocked in weekends where I felt it would all work. The problem I quickly found was that although the dates worked for me they didn’t work for others. I would advertise a Reiki 1 course for example and have one person book a place with four or five others interested but looking for different dates. At first I tried to juggle this, attempting to adjust dates, connect people up etc but the more I did the more of a mess it became. Even my husband was asking me if I wouldn’t just be better waiting and letting it all sort itself out. Eventually I learnt that if I just handed it over to the Universe it all fell into place. This was really hard for me to do though as being in control is what I was used to but somehow it worked and over time it did get easier. I also found the letting go of control spilled over into other areas of my life and I began to learn that sometimes it is best to just sit back and go with the flow. Yesterday trying to be a little more proactive I advertised on Facebook that I am looking to arrange a Reiki 1 course. So far I have had several enquiries and have been able to send out information. I have no dates booked but as before I will arrange these with people who are definitely interested. It is far too soon to tell how this will work but it does feel a slightly better balance and allows me to put some energy out there, the energy of being willing and available to work. I am not really taking back control but just giving the Universe a bit of a push and maybe finding a better balance which now feels as if it should be a partnership. I can be pretty ruthless when it comes to clearing out but with clothes I always find if good to have a second opinion especially when I am throwing out things that still have a lot of wear in them. Yesterday with that second opinion I filled several bags with things that were too tatty to keep even if I loved them, things that I hadn’t worn for ages and sadly some things that I love but can no longer fit in to, unless I hold my breath and don’t eat when I’m wearing them. Having done this it then dawned on me that I have been clearing out in other ways too. I have deleted several groups from my Facebook groups, groups I hardly visit and groups I no longer enjoy. Even though these groups were just sitting there doing nothing what is left still feels much more manageable somehow. I have also deleted any friend requests from people I don’t know and have been through my lists of friends to check I really do know them all and that no-one has sneaked in. Having done this I have since found is that my attention is being drawn back to things that I hadn’t been interested in doing for quite some time, my OBOD studies being one. I have quite clearly had too much junk around without realising it but now by ditching some of it space is already appearing. It’s really interesting as I’d not been aware of how much my attention was on things that were clearly in the way. I am just back from holiday and like all holidays it has been full of new experiences. This can be something as simple as trying a new cocktail but in my case included seeing an Ocelot on a night drive, mastering how to stand up on a paddle board and making tamales and tortillas with a women’s co-operative in a Mayan village. I really do appreciate I am very lucky to be able to travel and I have come back home full of enthusiasm for trying new things whenever I can. I am also very lucky in my work as every new client or student brings me new opportunities to grow, develop and learn as I work. This is the nature of shamanic work and of teaching anything. I make no apologies at all for highlighting how important new experiences are to us. So how can we gain new experiences on an overcast day at home when we have empty pockets? Go, experience and enjoy, I certainly will be. I am not sure if I have mentioned this before or not but I don’t meditate. This is something that often comes as a surprise to people, especially my students when they first hear it. I have a theory about it though and that theory is connected with my shamanic work. In shamanism when I shift into light or deep trance there is always a reason for it. I am always seeking insight or information or am carrying out a task of some kind in either ordinary or non ordinary reality. Were my intention to be to empty my mind and for it to stay that way then I would not be able to do my work. It’s not as if I haven’t tried. I can clearly remember when I was training in Chios Energy Healing talking to my tutor about the difficulties I was having with the meditation. The meditation in Chios is an important part of the practice and in it the mind is cleared while the energy of the human body shifts to energetically become what is required of it. However, when I practiced when training my mind would fill with images, with scenes unfolding, information being imparted as they did so. I would push them away only for them to return almost immediately. Discussing this with my tutor I was told to just allow them to be, for they were there for a reason. And so I did and still do. None of this affects my ability to free my energy from its human bounds to allow it to be something else in any way. What I do instead of meditating is I do Reiki. Through self treatments I am able to be still and even though I follow the energy, am aware of where it is working in me and yes sometime receive information and insight even when self treating it still brings me into that meditative state. Fortunately there have been studies that have shown practicing Reiki to have the same effect on the brain as meditation so I am completely content with what I do. It can be really difficult to publicise and share reviews of my own work without it feeling like my blog is a sales pitch which it really isn’t in any way. It’s so much easier to share other people’s work than it is my own anyway but I think all authors feel that way. This week though I had contact with someone who really loved my book. 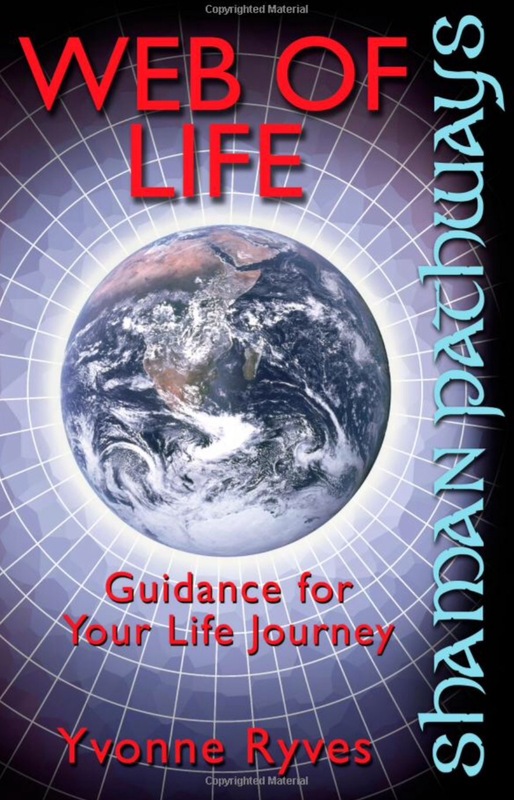 She was so enthusiastic about it that I really wanted to share what she said in case anyone was feeling lost or was searching for something that Web of Life might help to give them. 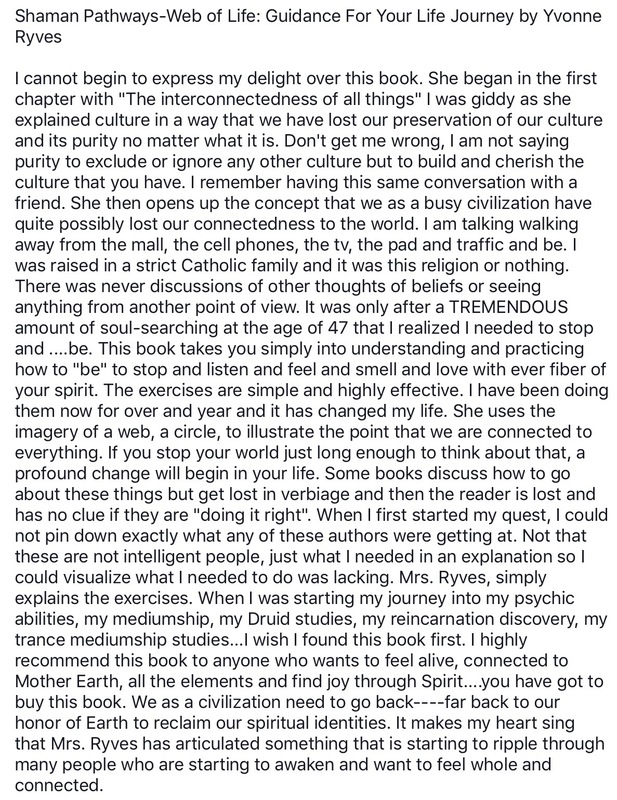 The review was posted in a Facebook group so the only way I can share here is via a screenshot so I apologise for the size of the text, any smaller and it’s illegible.